With just 10 days remaining until the curtain is drawn on “UFC 128: Shogun vs. Jones,” it was confirmed Raphael Assuncao and Erik Koch will indeed meet inside the Prudential Center in Newark, New Jersey. The featherweight affair will round out the card’s 12-bout roster. While Assuncao has competed inside the WEC’s Octagon five times prior, March 19th will mark his big league debut. Speaking of UFC rookies, Koch will put his two-fight winning streak on the line on MMA’s biggest stage. 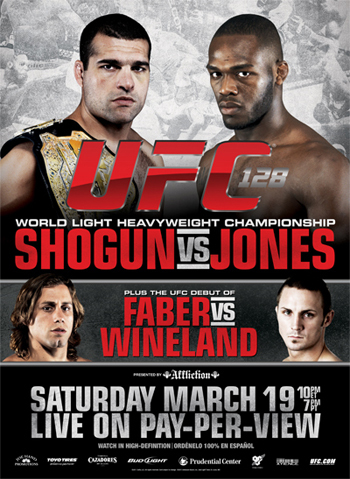 A light heavyweight title match between champion Mauricio “Shogun” Rua and Jon Jones will headline the pay-per-view broadcast. Thankfully, the UFC will offer up four free preliminary bouts to kick off the night’s festivities. The PPV broadcast begins live at 10PM ET/7PM PT.